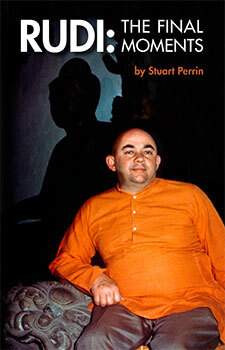 In this all-new revised edition, Stuart Perrin recounts the riveting story of the passing of his spiritual teacher Rudi. This edition has been completely re-written, and now includes many new never-before-seen images of Rudi, and exclusive stills from the DVD: Rudi: The Teachings of Swami Rudrananda. The book contains two novellas linked together by a common thread. They are both rite-of-passage stories in which the deaths of a parent and of a teacher force the young protagonists to re-examine their inner lives. The story, Rudi The Final Moments is an in-depth study of perhaps the most sacred marriage on earth — the union of a spiritual teacher and his disciple. It is a transcendental love story that could only find its inspiration in the human heart. It was an ordinary afternoon in late February 1973. Rudi, two students of his, and I, took off from Teeterboro airport around 5:00 PM. The sky was clear and I could see the sun setting in the West. We were headed to Glens Falls — a small town near Albany. The story moves from the past to the present, from my thoughts to Rudi’s dictation, from a clear sky to a fog so dense one can’t see ten feet out the window. A simple voyage in a four-seat Cessna airplane becomes an allegorical journey into a world of wisdom so profound it borders on sacred truths. Out of darkness comes light, out of death comes rebirth, and out of tragedy a new sense of purpose; and by the end of this fateful journey, nothing in my world remained the same. The South Bronx is the setting for this allegorical tale of a college student who returns home to discover that his father is dying. It is a tale woven from an accumulation of dreams about an almost mythic figure called the Dancing Man, who guides the college student, Joshua, into a transformative world that unifies both life and death. The story takes place on the South Bronx streets of my childhood, but its surreal nature could only be conceived in the feverish mind of a writer. It’s a love story and a street-smarts story that plumbs the deepest levels of human consciousness to discover how life’s mysteries are passed on from generation to generation. Eighteen years have passed since I first published the book now called Rudi: The Final Moments. Not only have I changed, but my writing style has changed, my teachings have changed, and it seems to me as if the very complex understanding I once had of the world has simplified itself, and what was far–fetched and beyond reach has found expression in my day–to–day life. At the center of it all is Rudi. I remember being grateful to him for allowing me to be present at the moment of his passing; I remember thinking that up to this point it’s been easy. The future will show me whether or not I truly learned what he tried to teach me. He told me many times that the guru lives in the disciple’s heart. It’s perhaps why I never felt great loss. From the very moment he took his Samadhi, I found him sitting in full lotus position at the center of my heart. It was like he had always been there — a remarkable being guiding me through the complicated evolution of my life. Very few people understand the dynamic that takes place between a spiritual teacher and a disciple. This is perhaps, the most sacred marriage on earth — a mystical union that’s essential for both their enlightenments. It’s also a means the universe uses to pass down spiritual teachings from generation to generation. It should never be taken for granted. The story of his death is so dramatic that just telling it makes good literature. The clear day, the densest fog I’d ever seen, the roar of the airplane motor, Rudi’s dictation, my mind moving from the present to the past and back again, the entire journey had an allegorical ring to it; and Rudi, who had told me many times that he would live to eighty-four, said his last words, “…a deeper sense of surrender,” and was taken by the hand of God. He was forty-five years old. From the moment that I wrote this book, I thought it had something important to teach people on the spiritual path. With this in mind, I decided to republish it under the title of Rudi: The Final Moments. With gratitude I re-offer this book to a reading public and hope some of its words inspire readers to go into themselves and excavate the vast treasure house of love and wisdom that’s hidden deep inside every human being.